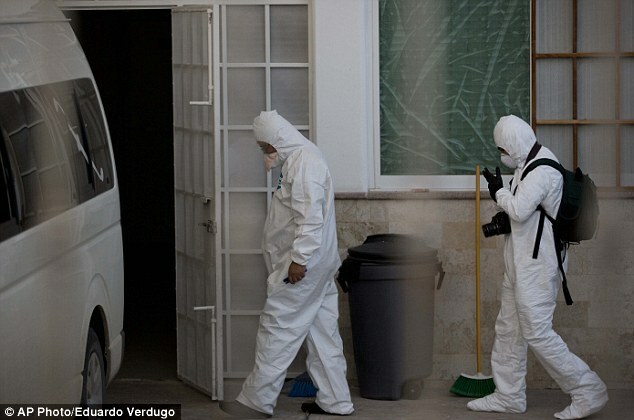 Mexican hitmen allegedly killed more than a dozen students who went missing last month after a clash with corrupt local police, then buried them in a recently-discovered mass grave. State prosecutors in the country said a man they arrested told how 17 of the missing youths were rounded up and killed, then thrown in pits, where badly charred remains have now been unearthed. Authorities said that the man told them how the students, who went missing after a violent clash on September 26, were marched to the site on the outskirts of Iguala, Guerrero state before their deaths. 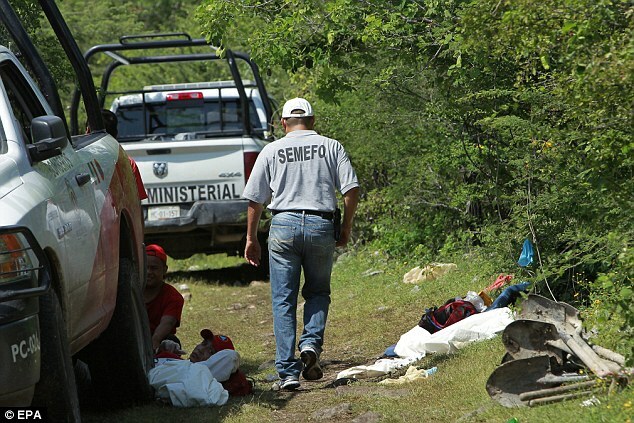 The bodies found by authorities are so damaged that they could not be identified. All that is left are bones and small pieces of flesh. Investigators found 28 bodies there, though local officials say as many as 34 were buried across six separate pits. It could be days before the identities of the dead are known for sure. Security officials said earlier they believed the victims had been driven to the end of the track, walked up the hillside, executed and buried in six graves. 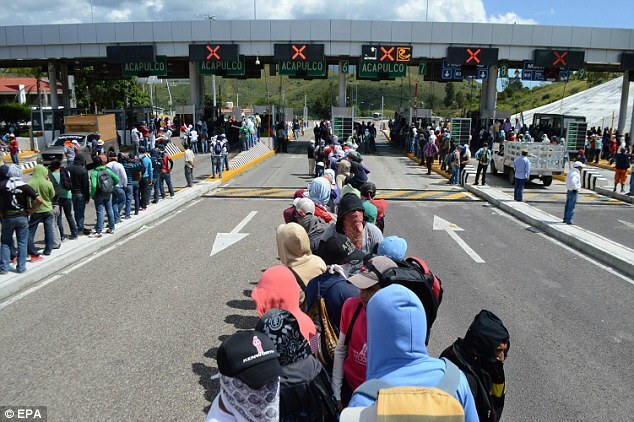 As investigators worked at the site, up to 2,000 protesters blocked a main highway in the Guerrero state capital of Chilpancingo demanding justice. ‘You took them alive, we want them returned alive,’ read a huge banner hung across the road linking Mexico City and Acapulco. 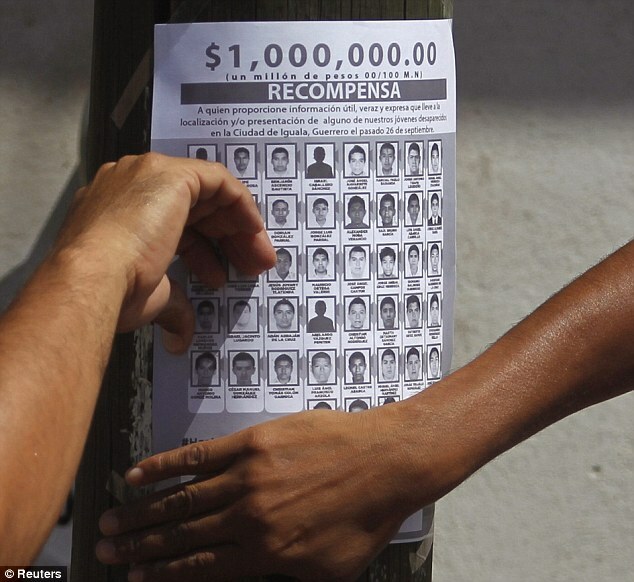 Jesus Lopez, an Acapulco street vendor whose 19-year-old son Giovani is among the missing, said he hoped the remains weren’t those of the students. Mexico’s National Human Rights Commission opened its own investigation into the case for possible ‘serious human rights abuses,’ such as extrajudicial executions and forced disappearances by Iguala city police. 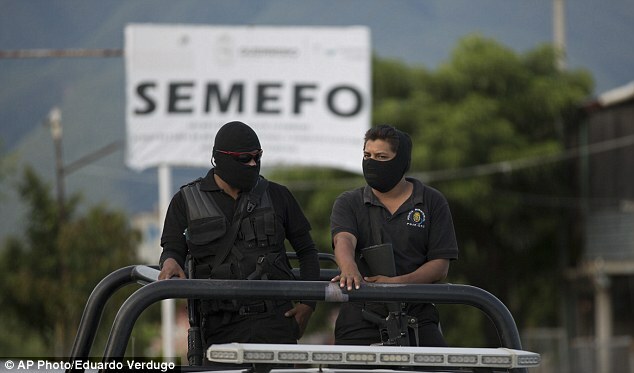 Police infiltrated by local drug cartels are suspected of abducting some of the students, a local security official said, speaking on condition of anonymity. One security official said: ‘You really can’t call them police’. He added that suspected gang members had told investigators that police had handed over the students to the people who killed them, who belonged to the gang. The suspected gang members had also helped the authorities identify the site, the security official said. Soldiers and police had cordoned off the dirt track where it ended not far from the graves, which lay about a 40-minute walk across rocky terrain inaccessible by vehicle. 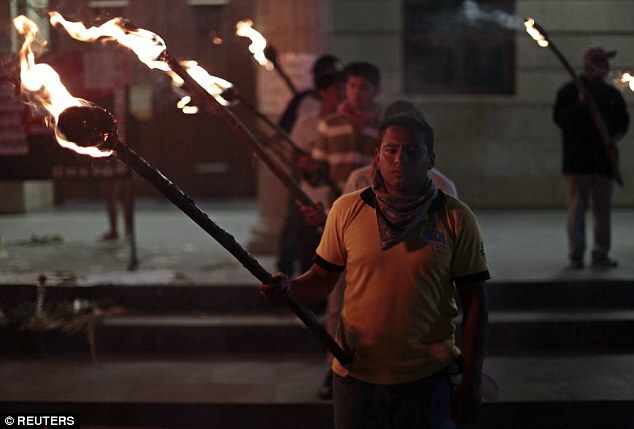 The fatal clashes took place in Iguala on the night of September 26. 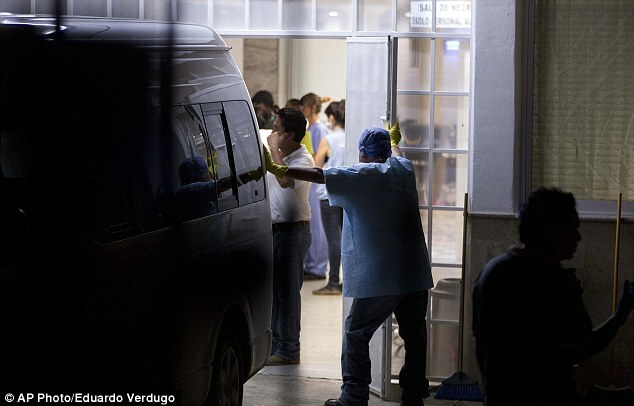 Thirty people, including 22 police, have been arrested in connection with the violence, which claimed the lives of at least six people and left 25 injured. 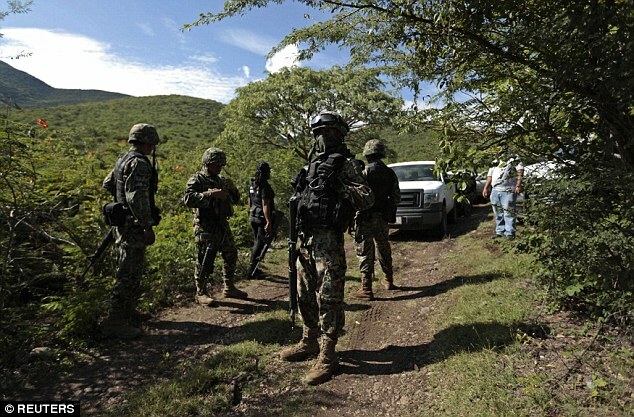 Information leading to the discovery of the graves had in part come from the interrogation of local police arrested after the clashes in Iguala, the security official said. 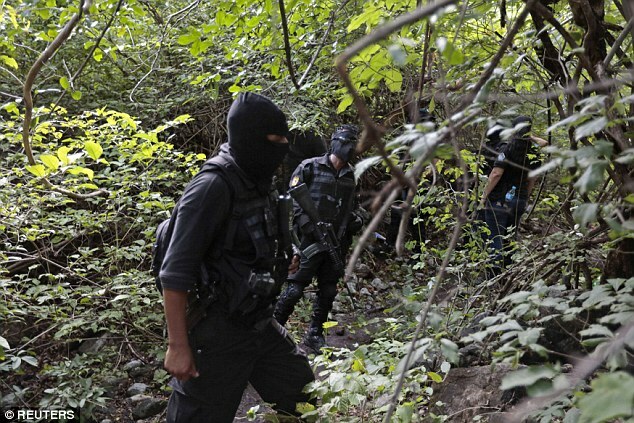 Guerrero state, home to Iguala and the resort of Acapulco, has been one of the most lawless in the country for years. Officials said the remains of nine people had been taken down from the hillside so far, with another 25 due to follow. PreviousStarting in 1938, GM bought out the public transportation in many Californian cities, including Los Angeles, Sacramento, and San Diego) and ran it to the ground so people would switch to private transportation.